Example of materials needed for calibration of a laboratory stand viscosity cup. One GARDCO Laboratory Stand Viscosity Cup. The Conversion Grid sheet (for cup chosen) to convert seconds efflux time (to nearest tenth of a second) to centistoke viscosity. Every Gardco Cup is furnished with such a data sheet. *These are nominal values. For the actual centistoke value of the standard, refer to the value on the bottle label. † Special temperature @ 23°C. Gardco Cat. No. TH-02232°F ASTM mercury filled glass thermometer, 10.8" length, 19-27°C. range. Gardco Cat. No. TH-02233°F ASTM mercury filled glass thermometer, 10.8" length, 66-80°F. range. Gardco Cat. No. TM-AX705 digital electronic stopwatch, 0.01 second. Examine the cup for obvious obstruction or damage to the orifice area and general cleanliness of cup. Place cup in stand and level the top edge. The bottom of the cup should be approximately 6” above the container bottom. Select the recommended Certified Viscosity Standard for the cup to be calibrated. Make sure the expiration date for the standard has not passed. Pour a sufficient amount of oil into a 250 ml container to exceed the capacity of the cup. Proper temperature is very important. Bring oil to target temperature of 25.0°C ± .5°C. Use a calibrated ASTM mercury-filled thermometer to monitor this process. By wrapping a hand around the container and slowly stirring oil, the temperature can be slightly raised. Fill cup to the top edge (slightly overfill cup and remove excess with a straight edge or glass plate), while holding a finger over the orifice. Pour slowly to minimize air bubble formation. Simultaneously release finger from the orifice and start timing with a stopwatch with accuracy of 1/10th second or better. Hold the thermometer in the efflux stream to insure the temperature remains constant throughout the run. Stop the timer when the first definite break in the efflux stream occurs near the bottom of the cup. Be sure to keep air bubbles at a minimum; they will sometimes cause an apparent break prematurely. Record time and temperature and repeat. Keep temperature drift between runs at ±.2°C. Disregard any runs that are more than .5 seconds apart. Divide the design time listed on Viscosity Standard by the average and determine the correction factor. Determine if the cup is in or out of tolerance according to manufacturer’s specification. Example of materials needed for calibration of a dip-type viscosity cup. One GARDCO Dip-Type Viscosity Cup. One pint of certified calibration oil (appropriate to cup chosen, see chart below) One GARDCO Laboratory Stand Viscosity Cup. **Note: The 8mm ISO Cup is not available in the Dip version. Container, 600 ml capacity glass beaker LA-2029060. LA-2029100 1000 ml glass beaker recommended for Fisher Dip Cup. Pour a sufficient amount of oil into a 500 ml container to totally submerge the cup. Using a calibrated ASTM mercury-filled thermometer bring oil to target temperature, 25.0°C ± .5°C. Proper temperature is very important. By wrapping a hand around the beaker and slowly stirring oil, the temperature can be slightly raised. Place cup in oil and allow 1 to 5 minutes for cup and oil to reach thermal equilibrium. Leave the thermometer in the beaker to insure the temperature remains constant throughout the run. Adjust times for temperature deviation and average three valid runs. * When many different determinations are to be made on similar products in the same viscosity range, it may be helpful to produce a graph for converting measured temperature and viscosity cup efflux time in seconds to seconds at a specified temperature, normally 25.0° C (77.0°F). Refer to "Temperature" in Viscosity Cup leaflet in this manual for a suggested method of preparation for such a graph. ** When finished with standard oil examine it for contamination of any kind. A fine wire mesh filter may be used if dirt specks are noticed. If oil is accidentally contaminated with water settled in bottom of tumbler, pour off clean portion of oil and discard contaminated water portion. Pour oil back into bottle and record the date of first use on the label. Stored in normal ambient temperature the oil is good for a year after date of first use, provided it does not become contaminated. 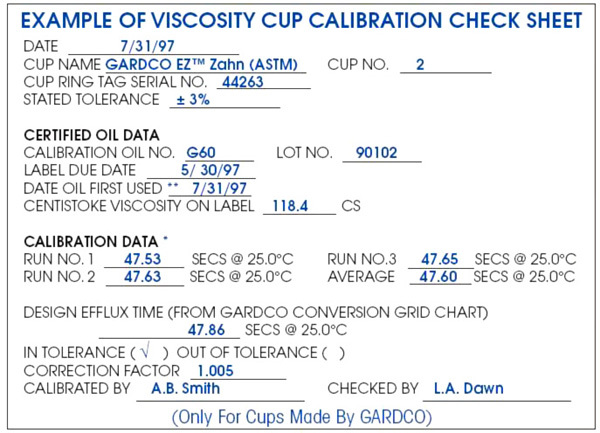 Guide for removing the G-series calibrating oil from Gardco viscosity cups. Any remaining material in the cup must be removed by flushing with a suitable solvent. Light naphtha, heptane, octane, highly aromatic solvents, and or any other petroleum-derived hydrocarbon solvent can be used. Varsol® is a commercial solvent that works very well for this purpose. Completely dry the viscosity cup with a lint free cloth. Use a highly volatile solvent for a second cleaning as since any remaining hydrocarbon solvents from the first process will evaporate quickly after the sample has been flushed from the cup. Hypersolve, MEK and Alcohol can be used in aluminum cups and Hypersolve and Alcohol for the stainless steel cups. Acetone is commonly used as the second solvent because of its high volatility and its ability to dissolve traces of petroleum solvents and water. In the third process a low velocity stream of clean air will be sufficient to evaporate remaining traces of any volatile solvent. Be aware, avoid rapid evaporation of these solvents as this can cool the surface to such an extent that humid air may be brought below the dew point, causing a film of water to form on the cup. A point of caution: Even the standard oils change in viscosity in the range of 3% - 8% per degree Celsius at the 25° normal measuring range. Temperature of products being measured should be adjusted to within 0.1° of specified temperature if accurate results are to be obtained. The information contained herein, or supplied by us or on our behalf in any other manner is based on data obtained by our own research and is considered accurate. However, NO WARRANTY IS EXPRESSED OR IMPLIED REGARDING THE ACCURACY OF THESE DATA, THE RESULTS TO BE OBTAINED FROM THE USE THEREOF, OR THAT ANY SUCH USE WILL NOT INFRINGE ANY PATENT. This information is furnished upon the condition that the person receiving it shall make his own tests to determine the suitability thereof for his particular purpose.